It's no secret that I love skincare. Moisturizers, cleansers, scrubs ... I love it all. But the one attribute they must all have in common? They have to keep me looking young. That's where WEI Tibetan Safflower Age Defying Face Cream comes in. This cream nourishes, enhances circulation, reduces wrinkles, even improves skin's color and clarity -- and it's my new best friend. And now it can be yours, too! 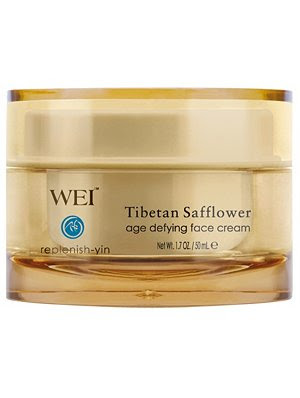 One lucky winner will receive a tub of WEI Tibetan Safflower Age Defying Face Cream, valued at $60. To enter, simply place your name and email address in the box below. The winner will be selected on Wednesday, August 11 and notified by email. This giveaway is open to US residents only. Giveaway runs until Tuesday, August 10 at midnight. One entry per person, email address and IP address. Multiple entries will be disqualified.